My first MMORPG was Meridian 59, which I played back in 1998. My job was very demanding so it was 7 years before I played another game. In 2005, I searched for a F2P (Free to Play) MMORPG and landed on Knight Online (KO) on the server Beramus, where I played an Archer named Taugrim. For the Rogue class, Assassin was much more popular than Archer. I wrote my first gaming guide, Guide to Rogue-Archer, to answer questions that kept coming up on the forums and to address the widely-held perception that Archers sucked. Archer’s mechanics suited me well: the class had excellent mobility, solid DPS, and enough spot-healing and cleansing to bail friendlies out of trouble. KO was fun, but the game was very hackable, and I grew tired of PVP’ing against players who cheated. So I switched over to World of Warcraft (WoW) with a few friends from KO during the summer of 2006. My first endgame WoW character was a Druid named Maeglor on Agamaggan. I fell in love with feral gameplay while leveling and tanking in particular, even though veteran Druids warned that Feral gearing options were limited at endgame and the community despised them. At level 60, I played the 11/33/7 Bear tank spec and rocked a Warden staff. WoW was the first game I played that had serious class balance issues, and because of Vanilla WoW’s gear progression design, very narrow spec options. The community was likewise very narrow minded about classes and roles. When The Burning Crusade (TBC) expansion launched, Feral became a viable option in raids, and I was one of our guilds main raid tanks. Eventually I got burned out of the raiding gear grind, so I quit WoW cold turkey in November 2007. I still wanted to play an MMORPG, but I didn’t want to deal with a grindfest. At the suggestion of a friend, who I’d been playing online with since KO, I tried The Lord of the Rings Online (LOTRO). LOTRO’s community was stellar, the game was immersive, and there were no issues of different classes playing the same role (e.g. main tank, main healer, etc), as there had been with WoW. In LOTRO I played on Landroval, first as a Captain and later as various Creep classes. Our kin raided in partnership with another and we eventually downed the Balrog, which was a fun achievement. I wrote several LOTRO class guides: 2 for Captain, 1 for Orc Reaver, 1 for Uruk Blackarrow. Some players gave feedback that tips in my Guides didn’t work, even though I knew from personal experience that they did. So I bought FRAPS to record footage and started publishing narrated PVP videos on YouTube in the summer of 2008, and the videos generated a lot of positive feedback and community engagement. In late Spring of 2008, I started following Warhammer Online (WAR) with keen interest. WAR was incredibly attractive to me, because it treated PVP as core game content. The concept of leveling up via RVR (Realm-Versus-Realm, which is another acronym for mass PVP) sounded awesome, and I was intrigued by the mechanics of classes such as the Warrior Priest, which used melee abilities to generate “mana” (called Righteous Fury) for healing. When WAR launched in September 2008, I switched from LOTRO to WAR. In WAR, I initially played a Bright Wizard to 40, published a bunch of narrated BW videos, and wrote my Bright Wizard Class Mechanics Guide. Due to a shortage of Order tanks on my server, I rolled a Swordmaster as my main character in November and continued cranking out narrated videos and wrote my Swordmaster Class Mechanics Guide. I intentionally chose Swordmaster because of the widely-held belief that SMs were useless (they weren’t), even though objectively I knew the Ironbreaker was the more powerful class. I played WAR until April 2009, at which point I unsubscribed because I was frustrated with the lack of server and mass PVP stability in Patch 1.2. In early July, I decided to check out WAR in Patch 1.3 on a free trial basis. The game’s stability had improved, so I re-subbed and played until mid September 2009, at which time I unsubbed because I wanted to try Aion, and WAR had gone from being fairly stable with the great Patch 1.3b to being very unstable and buggy in Patch 1.3.1. In September 2009, the North America version of Aion launched. There was a lot of hoopla about the game in terms of its polish and PVP potential. My initial impression was that the game was tedious but I leveled a Chanter to 40, by which point the grindy nature of the game just killed my interest to continue leveling to 50 so I unsubbed in early February 2010. I started playing the F2P game Allods Online in February 2010 but by the end of March decided to stop playing AO due to concerns about the game. In the meanwhile, I’d heard that there were several changes to WoW in Wrath of the Lich King (WotLK) that removed a lot of the grind that I’d detested back in TBC. So I decided to give WoW another try. This time around, I chose Balance as my main spec for my Druid and eventually decided to level a Paladin to play as Retribution in PVE and Protection in PVP. Prior to WoW Patch 4.0, my Protection Paladin hit level cap and became my main PVP character. When 4.0 launched, there were significant class changes that were introduced for the Paladin (and other) classes. There was a dearth of information for how to play the Prot spec in 4.0 in PVP and many veteran Paladins declared that Prot PVP would be dead in Cataclysm. I believed Prot would be viable, so I published my Prot Pally PVP Guide, and a copy of it was stickied on the WoW Paladin US forum. I reached 2k Arena rating in the 2v2 and 3v3 brackets as Prot in Cataclysm, and I was the only person to do so as Prot in those brackets in the Shadowburn battlegroup during the time I played. In February 2011, I started feeling restless with WoW, and I heard some very compelling things about RIFT, so I pre-ordered the game. RIFT had a terrific launch and was up to that point the most enjoyable game for PVP that I had ever played. I wanted to play a heavy melee class so I rolled a Warrior and published my Riftblade Warrior PVP Guide. In early June I switched servers to Sunrest and rolled a Cleric, because our new guild needed healers. The RIFT Cleric community widely believed that “melee healer” Clerics were not viable, but my gut feeling was that the mechanics existed to support melee-healing, it was just a matter of sorting them out. After hitting level 50, I wrote my M*A*S*H Melee Healer Cleric Guide, and to my pleasant surprise many Clerics overcame their skepticism, tried out the spec, and raved about it. I began to lose interest in RIFT with Patches 1.5 and 1.6 due to the overbalancing of classes. Star Wars: The Old Republic (SWTOR) was the next big hope for a great MMORPG, and I got full Beta access from BioWare and published introduction PVP videos for various classes. During the 1st week of launch, my guild rolled on Ajunta-Pall (US RP-PVP) as Republic, because we wanted to be on a server with reasonable faction balance, or at least to be on the side that was outnumbered, which is much more interesting than running with the zerg. In August 2012 I decided to stop playing SWTOR, as the vast majority of my guildees had moved on from the game, the game became more grindy in 1.3 which did not align with my limited free time per my new job, and I wanted to see how F2P was implemented before committing further to the game. Around that time, Guild Wars 2 (GW2) was in Beta, and its pseudo-action combat appealed to me. I played GW2 at launch on Blackgate. GW2 provided all the systems for PVP that I care about: battleground, tournament / ranked battleground, and World PVP. I appreciated the horizontal scaling system, especially in 5v5 tournaments, as gear was strictly cosmetic so therefore PVP was a level playing field. I also loved that you could play in endgame battlegrounds within literally a half hour of rolling a new character – this allowed players to experiment with new classes with minimal time investment. Over time I realized that with my focus on sPVP, I would never level my characters to endgame so that I could WvW with my guild, because in the first year of GW2, sPVP was completely disconnected from the rest of the game. I transitioned over to WvW full-time and played a Warrior and an Elementalist. The introduction of Ascended gear was a big turnoff to me, because it was a grindy system and you have to commit to particular gear stats, and therefore specs, as you buy Ascended gear pieces. In April 2013, on a whim I picked up World of Tanks (WoT) and it was the most pleasant surprise of any PC game I’ve ever played. WoT was easy-to-learn but hard-to-master, which really appealed to me. Skill was a huge determinant in PVP outcomes in WoT, which was how it should be. My only concern about WoT was the continued existence of gold ammo (aka premium ammo), which created a pay-to-win environment as the extent to which players can afford to buy and use gold ammo was correlated to how much money they were spending on the game (i.e. subscriptions, premium tanks, etc). In February 2014, I played about 5 hours in WildStar Beta and was on the fence. The game’s combat system seemed great but the game was buggy and had low framerate. I decided to give WildStar a go at launch and their implementation of action combat with telegraphs was the most engaging and highest skill cap combat system I’ve ever played in an MMORPG. I loved WildStar, but the endgame PVP system was horrific, which had gear tier gaps and gear rating requirements, and this created an environment where gear was more important than skill in PVP. 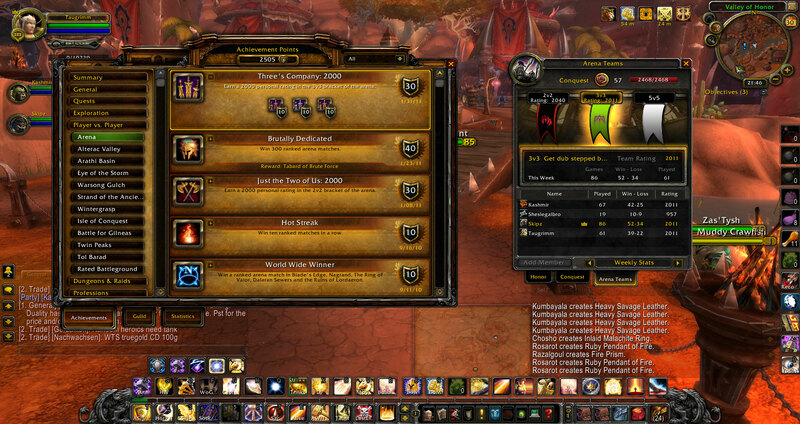 I reached 1885 rating in 2v2 Arena and 1791 solo queuing for Rated BGs, so I was able to acquire my full 1800 PVP gear. However, the runes on gear were RNG, which created an awful experience whenever you acquired an epic gear item and the runes sucked. Due to the RNG grind and increasing PVP queue times due to the declining playerbase, I unsubbed in early October. After I quit WildStar, I went back to WoT. Questions about improving one’s gameplay in WoT come up every day on the WoT sub-Reddit and on various forums, so I started a video series called “Road to Unicum” to share what I learned as I progressed towards purple stats for my account. In February 2015, I picked up GW2 after over a year away, and the game had noticeably improved. That said, the game failed to maintain my interest, and I went back to WoT and reached Unicum rating for my account. In October 2015, a competitor to WoT called Armored Warfare (AW) launched in Open Beta. AW was a fantastic game, and the PVP in tiers 4-6 was arguably the most competitive and skill-based context I’ve played in any MMO. That said, from tiers 7-10 the game suffered from very poor class balance as Main Battle Tanks (MBTs) were extremely difficult to penetrate frontally. Fights between high-tier MBTs devolved into “pixel hunting” of very small weak spots. These two dynamics created a frustrating experience for many players. The PVP population quickly shrank – many players went back to WoT and other AW players focused their time in PVE – and by mid-2016 PVP queue times were unacceptably long (5+ minutes). Obsidian undertook a large class re-design effort with “Balance 2.0”, but unfortunately in February 2017 Mail.Ru fired Obsidian as the developer and took the development in-house. As it turned out, before that news broke I had already gone back to WoT in January 2017, not because I believed WoT was the superior game, but simply because it had a large active population. I was reluctant to go back to WoT as I was a huge fan of AW’s game design, but to my pleasant surprise I found myself enjoying WoT and have continued to play it. I played Overwatch for several months after it’s launch in May 2016. It’s an excellent game, but my aim is very mediocre. I have gradually decreased my mouse sensitivity and bought a large gaming mousepad, but I believe that I’ll never develop good FPS aim skills, so my performance ceiling in games such as Overwatch is pretty limited. I tried the Beta of Gloria Victus but the combat just didn’t pull me in, so I haven’t played since. I backed Camelot Unchained for $60 USD back in 2012 (good grief it’s been ~7 years already?). I also backed the kickstarter for Oath in April 2019, but it’s looking like that game may not make the funding target in time. It’s been 20 months since I played WoW, and I never played an endgame mage, so I’m not the right person to ask. Please say hi to ARC and Robin for me, and thanks for dropping by! Hey Taugrim. Hope you remember me (the mighty Magus ;D), we had some good fights in WAR. I’m playing LOTRO now on Landroval and I noticed some old post of yours. Couldn’t believe it was the same person but low and behold it was. Anyway, just wanted to say heya and if you ever decide to drop back into LOTRO gimme me a shout. My name there is Zhanthir. Funny that you saw some of my old posts on the LOTRO forums. I was very heavily involved with the LOTRO community on the Captain forum and on the Landroval server forum, back when I played LOTRO from November 2007 to September 2008. I doubt I’ll play LOTRO again. That game has a terrific community and some aspects of the game are really well done. I just got tired of the limitations of the PVP system, especially the ridiculous amount of CC. If you get this response, let me know which Freep and Creep classes you play, I’m curious. Taugrim, i’d suggest you take a look at LOTRO again if you haven’t in a few years. They made substantial changes to PVP and have included DR on all CC abilities. 4th CC and beyond is just an interupt. Turbine has also made signifigant advances towards balancing creep and freep classes so each can hold their own in 1v1’s. Granted this balance isn’t always perfect due to the insta-buff creeps get when the level cap is raised, over freeps having to lvl, grind new gear, etc, but it’s still a lot of fun. Here’s a video from about a year and a half ago of me vs a R10 Warg on Candy Mountain. Oh I played a LM too, and you know how CC heavy they are. My name is David Lui, and I am a Marketing Coordinator for F2PMMO, a new publisher of online games and unique services. We are excited to announce our new game portal, F2PMMO.com, which will launch at least two high-quality MMORPGs per month for the global free-to-play market. Our first addition, Heroes of Gaia, launched on December 7th. We have noticed that your blog features highlights and articles about other popular games and would be delighted if you would consider publishing an article about our game or/and our services. We will also provide you with bids for our unique reward system. I appreciate your consideration in this matter, and please don’t hesitate to contact me for further questions. Confidentiality Warning: This e-mail contains information intended only for the use of the individual or entity named above. If the reader of this e-mail is not the intended recipient or the employee or agent responsible for delivering it to the intended recipient, any dissemination, publication or copying of this e-mail is strictly prohibited. If you have received this e-mail in error, please immediately notify us by return e-mail. Thank you. We will also provide you with bids for our unique reward system. Are you talking about compensating me with reward items for writing about your game(s)? Or are you talking about providing me with rewards that I could share with readers of this blog? E.g. use this reward code and get a free +1 sword for your new character in a game. I’ve seen other blogs sponsor game rewards that way. I want to maintain clear disclosure so that readers of this blog understand if and when I have any potential conflicts of interest when writing about games. I just started playing Allods and i’ve been trying different classes and builds to see which one was my preference, and it turned out your healer spec was. Now ok, ‘Thanks’ i hear you say – but what brought back a lot of memories was your name! I doubt you remember me that much, but waaay back in the day, when we played KO, we met through my dad – ARC. I don’t know if you guys keep in touch anymore, its been so long, but im sure he’d love to hear from you. I remember your guides being of endless help to the both of us,(and no doubt everyone who read them!) so i’m really glad to see your still a gamer. My dad plays WoW now too, i think he has a lvl 80 Paladin and Rogue, and numerous other characters, although for the life of me i can’t remember on which server. It’d be great to hear from you – keep up the good work! Of course I remember you and your dad. Every now and again ARC and I email each other. I still keep in touch with Mahdi (Kerchek), you may remember him. I recently transferred my 80 Druid from Agamaggan (US) Alliance to Wildhammer (US) Horde. Great info on prot pvp Taugrim – thanks so much! I recently resurrected my vanilla wow pally I had left at lvl 60 and with the help of your posts/blog I’ve been having a lot of fun at 85 in BG and even with some 2v2 arena with a buddy playing a feral druid. I would really love to see some specific – even just bullet points – tips on how to beat other classes 1 vs 1. Tips like, what to look for, how to play ( aggressive or defensive ) which seal or auras I should make sure to have on when fighting each class… stuff like that. Anything would help, there may be something like this already posted somewhere you could point me to just thought I’d come here first. That being said, I did decide on Feb 23rd to switch from WoW to Rift. For 1v1 the best way to learn is to simply duel people and talk to them about what special abilities they have. Hi, I discovered your blog since your early post on the Rift forums (i believe you were lvl 15-30 at the time). Just wanted to say that I’m a big fan of the blog; lots of depth, content, and insight. I’ve been playing Champion/Paladin/Paragon (32/26/8) melee & block focused from lvl30-50 before 1.1 and now after. It works great in PvP; great DPS, great survivability, nice set of CC harassment tools; two stuns/two charges/two cast-interrupts/AoE melee spam/ranged interrupt/powerhouse finishers/bloodthirst etc. After 1.1, I’m beginning to sway towards replacing the Champion with the Riftblade soul BUT played somewhat similarily in mid-melee ranged combat; riftwalk, planar blade, ignores armor, 3pt bursts (500-720 upon crit), etc. Attack points build up very quickly with combination of reactive abilities and buffs. I was thinking of replacing paragon because turn the blade does not seem to proc, and rising waterfall is slow, and strike like iron doesnt seem to work properly. Thanks for keeping up such an awesome blog. It’s funny that you mention Champ/Pally. I’ve been looking at different specs and I think that would be my next choice after RB/Pally, for the reasons you stated above. LOL, that is awesome. I’ve got nothing but good things to say about that build. Many 2H champs will take you for granted, unfortunately for them :\ Premades and skilled players will realize that this build is a big threat, and you’ll been tunnel-focused to hell sometimes by champs and mages. But man, sure as hell reassuring and that we’re thinking along the same track (I think lol). Do you still play WOW? here soon i going to try rift since I hearing good things, but for now I focused on wow. 1st time in 6 years I am playing another class than a Warlock, and I am finding my Binding doesn’t cut it for Melee, I saw your key set up you posted but watching your Prot videos I know you have things on other keys. Any chance if you willing so I can have a better look just email me your binding so I can load them into wow and see them all, I tried take a pic of your videos but can’t see them that way. my email is GuthanRulez@gmail.com much thanks. I usually only play one game at a time, and right now that game is Rift. Rift’s been awesome so far, an unexpected surprise. but besides the ones you posted which are the basic, you got any others that would be great that you use? My name is Catherine Meyers, I’m the admin of a modest games site and high traffic blog directory, I’ve been checking your blog and I find it very helpful and informative for anyone taking up a MMO, so I thought you could be interested in a link exchange, (no money involved), with my sites, this might help increase the visits to Taugrim’s PVP Blog and get nice comments and feedback. Let me know if you are interested to send you the links to my sites. Today we are announcing the launch of MMORaid.com, a new MMO social gaming news site, and we would like to invite you to join us. MMORaid is dedicated to bringing MMO fans the latest up-to-date information on all news and happenings in the MMO industry and communities from around the web. We also know how hard it can be for smaller blogs and MMO news sites to get exposure for their articles. With this in mind our goal with MMORaid is to give smaller sites a chance at greater exposure by allowing our readers the opportunity to vote for what they believe are the most interesting articles. Signing up is free and only takes a min to complete. Love the blog, very insightful and your videos are oddly relaxing :) I wonder if you could tell me what plugin you use for the comments, specifically the ‘post comment’ part. Hey Taugrim, I played Hashi, a mage on Beramus KOL (Everlong Clan), and RoadRunner, an archer on Edana. Enjoyed your posts for that game and glad to finally put a face to them. Keep it up! Cheers! Hey Taugrim, I played a warrior (Wellard) in a guild led by you amongst others and later an archer (inspired by your good self) on Beramus KOL a few years ago. I have to say, I’m quite impressed with what you’ve accomplished and it’s great to finally put a face to the name. You might also be surprised to hear that the old Knightsunited fan site is still going. Wellard! Of course I remember you. We had fun times back in KO, I just wish that game wasn’t so pitifully hackable. If it weren’t for the rampant exploiting, I might never have moved on to WoW. Haha so funny, was going through swtor stream looking for someone that was pvp’ing. Finally ran into ur stream. Remember ur SM video’s like 5 years ago, was playing a SM as well at that time. Old memories, haha. I hope they’ll allow some interserver pvp at some point, would love to duel u a bit:P..
We’ll going to pick a PVP-RP server. First of all i play in a small scale tight group, and we’re joining a pvp server there is some initiative with some other competitive pvp guilds, so we’ll all join the same server and be sure to have tons of good pvp. Secondly I’m EU, so wouldn’t work all that well:P.. But if there won’t be inter-server fights where they also link eu and us, I might make a pvp vid some time. Happy Thanksgiving from Key West Taugrim! It is a pleasure to see that you have joined The Republic podcast on Gamerbreaker TV as well as streaming the SWTOR Beta on Twitch. I watched your stream everytime you were broadcasting this past week. I am on Sunrest in RIFT (Conman, 50 Warrior) and have enjoyed many PVP matches with you and your guildmates. I am actively searching for a PVP guild on the Republic side of SWTOR and have a huge interest in joining your guild. I am curious to know the process I would go about applying. Any kind of reply would be much appreciated! Take care! My guild leader anticipated that my covering SWTOR / streaming might result in incoming requests for ginvites – more requests than we can handle in terms of growing carefully, as we’re a small guild (about a dozen active players). For now I’m letting people know we’re not recruiting. If / when that changes, I’ll post on my blog letting y’all know. No, I don’t plan to. I heard / read a lot of things around the AoC launch that would make me uncomfortable as a customer. LOL, just found this post on your gaming history. You know, I started in Meridian 59 too. Too funny. I played on server 3 (IIRC) with an anti-PK guild called the Amber Order. I also ran some PKers, but there were used to infiltrate enemy PK guilds. The politics of that game were quite interesting with a limited resource of guild halls. I originally rolled on Server 200, which was the first non-PK server, in a guild called The Blue Dragons. Our guild had about 15 actives IIRC, but we had that bigass keep as our guild hall out in the middle of nowhere, can’t even remember the zone name. The guild hall was enormous, but we had to farm to pay the upkeep. M59 taught me that people *really* value their online gaming relationships. Crazy to me at the time, because I played because it was a game and could hang with my RL best friend. I did eventually re-roll on a PK server, because I wanted to experience that at “endgame”. Watched the SW:TOR livestream and i kept trying to figure out where I knew the name Taugrim from. Surprised to learn that it was from Allods, a game where IMO the only great and outstanding aspect was the graphics. I personally got to LV36 as a Melee Healer (became too hard to lvl up at that point) and LV40 on a Necromancer before the Great Exodus of players happened. Your name was big on the forums for some reason, and I just think it’s a shame that greed ruined what could have been an amazing game. So anyway, I’m probably gonna read some of the content on this blog, looks worth it, and also there isn’t really much else to do at the moment since i’m fully awaiting the official launch of SW:TOR. People knew me in Allods Online because I wrote the stickied Melee Healer PVP Guide. It was too bad what happened with AO. It could have been a big-hit F2P game. Small world, really. I’ve been reading your SWToR posts since I saw you on gamebreaker, and knew your name was familiar. Turns out, we ended up on the same servers for LoTRO and WAR. In LoTRo, I didn’t PvP too much, but played a Champion named Encaitaruil. In WAR, I was a Sorcerer and a member of the guild Scorn. Now, in SWToR, I have a Valor 62 Assassin, Darkness spec (Powerr’s build), previously Deception. Just thought I’d say hi – doubtful you remember either of these characters, but wish you the best in SWToR. Where did you roll for SWTOR? I rolled on Shadow Hand, PvE. Weird, right, since I was on PvP/RP for all the previous ones. Forgot to mention my WAR name: Talrithin. I mostly rolled on this server because of a bunch of RL friends. They also forced me to roll Empire. :[ I wanted my Jedi Shadow. Im from Brazil and I have played Allods and Rift thanks to u! In GW2 I will try to thank you ingame. I love the game play in TERA, but I don’t think I’ll be playing much PVP. To me it seems kind of spammy (not as much spam as say Rift) but the PVP Battlegrounds seem like they’re not very well thought out and I have concerns about PVP balance. They disabled BGs because of level 60 abilities breaking PVP. With games like GW2 coming down the pipe, I don’t see myself trying to sort out PVP in TERA when I can play the much more complex and fulfilling PVP in GW2. Hrm, I thought you played DAOC back in the day. The name sounded really familiar. Mid/Perc. I thought I recognized the name. I played a bit with you in WAR (Religun – Witch Hunter) and Aion (Xedex – Sin)as well. Good to see you doing things with Gamebreaker and games in general. You seemed good at it. Good luck. thank you for your wonderful blog and videos. I was wondering, If you plan to take a look at “The Secret World”. I have been playing it since the beta and I think the quite unique skills/abilities system would be something, you might enjoy wrapping your head around. Players could certainly use your input. Its pretty complicating, challenging and at the same time fascinating and rewarding. I’m swamped with RL work atm, so I probably won’t be picking up TSW. If that changes obviously you’ll know here. I’ve been a fan of your videos for awhile, but I never realized that, back in the day, you used to run with Phoenix Throne on WAR. I was a RR60 something Shaman named Gnashy. Made me smile and remember the good old days of WAR, which I still remember fondly. I didn’t end up leaving until 2011. You probably would never remember me, but I do remember seeing Taugrim the Swordmaster in Scenarios quite often. We usually lost, but it was always cool seeing “famous” members of the server community. Once PT merged with Badlands, I only stayed for a little while. Anyways, reading this gave me some nice memories of WAR while it was great for me. Thanks for that! Also, nice to see an RPer who also is an avid PvPer. I don’t RP, but RP players are fun to hang around with, and across multiple games I’ve played, the RP-PVP servers had the best community and realm pride…from LOTRO (Landroval), WAR (Phoenix Throne as you know), and SWTOR (Ajunta Pall). Hey Ed/Taugrim! Love you on Gamebreaker (and thanks for introducing me to Gamebreaker by the way!). Any idea which GW2 server you will be playing on? I’m trying to find a homeserver for my guild (which is far more casual than you all, but its a great group of people) and I was hoping for some tips or ideas on what to look for. Hey Ed/Taugrim! Love you on Gamebreaker (and thanks for introducing me to Gamebreaker by the way!). GAMEBREAKER rocks – the team has a lot of talent and insight into MMORPGs, so it’s a pleasure to work with them. Any idea which GW2 server you will be playing on? I’m trying to find a homeserver for my guild (which is far more casual than you all, but its a great group of people) and I was hoping for some tips or ideas on what to look for. We haven’t selected a server yet. We may wait until after launch to announce where we’ve rolled, so that we can sort out the server populations and such. I really love the site and all the content you put out. I’ve been following since SWTOR and I keep coming back for your insight into the games. I’ve playing GW2 now and I’ve really enjoyed your builds. I’ve got limited time to play the game so I always just use your builds as a starting block to tweak. Glad to hear you get value out of my content. Hey, have you ever think about playing Neverwinter? probably is the less p2w game of perfect world. If you have already consider it and decided not to play can you tell us why. PS: Old knight Online player here, from Beramus too, karus side! LOL I remember that clan! What were your character names? I’m wondering if they’ll ring a bell. Can you believe it’s been 10 years? Man MMOs are shi…. don’t event exist any more.